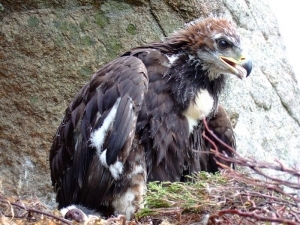 GE 60877 is a female Golden Eagle chick reared in County Donegal in 2011. More content to follow. GE 60876 is a Male Golden Eagle chick reared in County Donegal in 2010. More content to follow. Spéir is a Male Golden Eagle chick reared in County Donegal in 2010. Spéir was the younger of two male chicks in the nest. There were only three Irish Golden Eagle Chicks reared in 2010. It was reared by an adult female that only four years of age and was collected from the Mountains east of Loch Ness in 2007. the adult male was five years of age. In 2006 it was collected from the uists, in the Western Isles. This pair had formed at a very young age, in the summer of 2007, when the female was only just over a year old and the male was only just past its second birthday (Just into its third year). They have been in the same area consistently since then. In order to protect the nest site over the coming years, we can not disclose its location within the county. I remember the first time I saw spéir. I was using a rope to abseil half way down a cliff into the eyrie, hoping to see a single healthy chick. When I saw two chicks in the nest, I found it difficult to control my abseil ? I was so excited and elated to see two well feathered eagle chicks in an Irish nest. Unlike the Glenveagh eyrie, there was no active management support for this pair. Spéir and its sibling were fed rabbits, Fulmars, Hares and a Grouse and for a first time breeding attempt to rear two chicks is very encouraging from the project?s point of view. The nearby farmers are very supportive of their local eagles and deserve enormous credit. Spéir left the nest in mid July and spent its first few weeks near the eyrie. Its older sibling began to wander away from the nest more quickly. But now Spéir has begun its own new roving adventure! "Spéir" is the Gaelic word for "Sky" and we hope our Skies can once again carry soaring Irish Eagles ! Conall, a male Golden Eagle chick, was one of two wild bred chicks hatched and reared by released Golden Eagles in Glenveagh National Park in 2009. A male Golden Eagle, Blue 3, collected from the Isle of Skye in 2002 established a territory in Glenveagh in the spring of 2006 and was joined by a female, Yellow Diagonal Bar, collected from Assyant, Sutherland in 2001. They bred in 2007 and reared one chick, but failed to breed in 2008. This pair laid two eggs, again in Glenveagh, in early March 2009. The first egg hatched in late April 2009 and the chick, a male, was called Conall. The second egg hatched 2-3 days later and the second chick was also a male. We removed the second chick after 4 days and reared it for several weeks with a falconer in an effort to ensure both chicks fledged. Over 90% of second/younger Golden Eagle chicks die in the nest in Scottish Golden Eagle sites, as happened in Glenveagh in 2007. Conall stayed in the nest throughout the remainder of April, May and June until fledging in early July. The nest was on a well sheltered ledge. However during a particularly cold and wet period in mid May, the adult female was seen to stand over Conall, which was sitting in the nest, as wind driven heavy rain blew horizontally onto the nest. Conall was fed a variety of prey, including Hares, Badger Cubs, a Fox Cub and a single grouse. During its initial weeks the adults birds were usually to be found on the nest. But toward the end of the chick stage the adults only visited the nest briefly 3-4 times a day though they were often noted overlooking the eyrie from a distance. Conall grew steadily throughout the 76 days before it fledged. 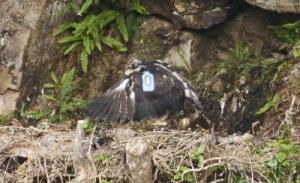 On the 18th June Conall and its younger sibling were fitted with wing tags. A blue tag was put on the left wing and a red tag on the right wing. Conall has a number O in the middle of each tag. It was also fitted with a satellite tag, made by Microwave Telemetry. (Its younger sibling has a number 1, i.e. Blue Red 1 is its individual identification). Conall left the eyrie in early July. It spent a day or two below the nest before moving uphill to sit and await food from the incoming adult eagles. Over the next few weeks Conall began to build up its flying ability. By early August it was able to soar briefly as it built up its own wing muscles and flying abilities. It younger sibling was usually in nearby attendance. We have had excellent satellite coverage of Conall's movements since then (July to October) but we decided against placing them on the Website, because they could lead to the discovery of the nearby nest and thereby lead to the disturbance of future breeding attempts. Rather than identifying this Donegal bred Golden Eagle chick as Blue/Red O we decided to call him Conall. 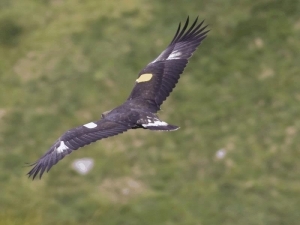 This is the first Donegal bred Golden Eagle chick to be fitted with a satellite transmitter. The old Irish name for County Donegal is Tír Chonaill (the land of Conall) ? so Conall seems an appropriate name for a Donegal male eagle. Check out this website regularly to find out his latest exciting movements, as Conall begins to explore the Hills of Donegal and beyond. 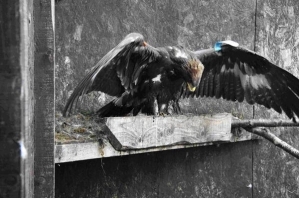 Two Golden Eagle chicks were fitted with Satellite tags prior to release in 2005. Orange 3 remained within the Derryveagh Mountains for most of the winter. It occasionally wandered over to Meenirroy and Cark Mountain to the east in late 2005. During early 2006 it was found predominantly on the western edge of Glenveagh and to the west of Slieve Snacht, where it was located for most of February. It appeared to be quite sedentary and it apparently was roosting in the same area for several weeks. For a few weeks it stayed around Crolly, Donegal around March 25-Apr 10 before moving on again. The transmitter has now stopped sending out signals. Two Golden Eagle chicks were fitted with Satellite tags prior to release in 2005. The second satellite tagged bird, Orange 4, has had several distinct foraging areas during its first year. It spent some time in the SW of Donegal between Glengesh, Slieve Toohey, Slieve League and Mulnanaff before skipping eastward onto the Blue Stacks. It spent several weeks wandering all around the Sperrins, between Omagh and Dungiven, and other small adjoining hills in Northern Ireland. This bird is now back in south Donegal and we eagerly await to see its autumnal movements.